Chillin' in the parking lot. WWF Attitude sold volumes with its horrid gameplay system, so it wouldn't take much for me to believe that WWF Royal Rumble will sell on its license alone, despite its shortcomings. The gameplay and control of Royal Rumble is adequate enough, but just can't compare to the better wrestling games. The game just feels so slow, and it is missing so many moves common in other wrasslin' titles. It annoys me that I can't get them out of the ring. I hate that there are no team moves that aren't tag assisted, and the tag team implementation and moves stink on their own. I want to smash a chair over the designers for the awkward and clumsy punch combos, which have a mind of their own and continue into the air at their heart's content. Having a run button double as the block button is just a poor design decision as well. The control and fighting is tolerable on its own, but comparing it to a truly excellent grappler only makes it look far worse. If the fighting engine were that good, I could possibly overlook the lack of options. Sadly, it's not. There's nothing in these matches that stand up as a single player experience. Begin a match and watch as people just pile up into the ring. The lack of intros really hurt the heart of any WWF match. Play a bit more and you'll find that you're doing the same slow and repetitive motions again and again against bad AI. Yep, for only $45 you too can stare at this guy's ample posterior. The reversal system is poorly implemented (you can only counter grapples), and matches tend to end too quickly for the finishing move meter to properly charge. After a minute or two, the lights dim and the wrestlers find themselves in a parking lot or other environment. What initially sounded exciting and fun comes across as lame and poorly done. I'd rather a more realistic and fun ring match than hastily thrown together gimmicks. The environments don't add all that much to the match anyway, and if they were absent you'd probably never miss them. Jakks Pacific programmed both the excellent Wrestlemania 2000 on Nintendo 64 as well as this Dreamcast offering, so it's not as though these people can't make a good wrestling game. Speaking of the developer, Jakks was able to include about 60 wrestlers on a cartridge, but they can't put more than 22 on a GD-ROM? Granted, most of the popular superstars are included in this game, but the roster is still lacking compared to other games. Of course, you can play as The Rock or Stone Cold, but if you want to try your hand with the Dudley Boyz you're out of luck. No girls in the game, so Chyna's out, and no jobbers means no Blue Meanie. WWF Royal Rumble is also missing a "create a wrestler" mode, any kind of tournament mode, good introductions (Rumble's intros last like three seconds), and all the other bells and whistles that players have come to expect. WWF Royal Rumble is a mediocre effort and use of the license. 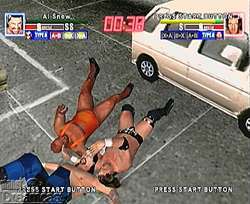 With only 22 wrestlers and subpar graphics and gameplay, the game should only appeal to desperate Dreamcast owners. Yeah, this is still the best grappler for the US Dreamcast, but that's not saying very much. Highs: Good sound, lots of characters in ring without slowdown. Lows: PlayStation dolls in hi-res, shallow gameplay, few characters, no options. Other: 1-4 Players, VMU Compatible (3 Blocks).